On most days, Firefighter Nicholas Polovoy and the members of Engine 284/Ladder 149 respond to calls around the firehouse’s neighborhood of Dyker Heights, Brooklyn. But the night Hurricane Sandy hit New York City, they were responding to back-to-back emergencies in a 25 mile area between southeast Brooklyn to the southern tip of Staten Island. “It was organized chaos, you could hear it on the radio, dispatchers relaying information all at once,” he said. As another company tried to get to the victims, Firefighter Polovoy and the members of Ladder 149 were sent to Sheepshead Bay, Brooklyn, for a fire. They could maneuver the fire truck within three blocks of the address. When the members exited the rig, they were in waist-deep water that was quickly rushing down the street. “We were tripping on things, then trying to quickly find the tools we dropped,” he said. Once they reached the two-story house, they found the top floor fully engulfed in flames. The front door of the residence was several steps below street level, so Firefighter Polovoy and other firefighters went to the building two doors down, which was on higher ground, and evacuated the people inside. They went to the backyard, where the ground dipped again. They found a ladder and waded through neck-deep water to reach an area where they could climb to the roof of the structure next door to the fire building. The wind was blowing in every direction, moving flames dangerously close to the members and quickly spreading the fire. Due to the flood conditions, members of the engine had a difficult time locating hydrants, and when the tide receded a bit, they were able to start getting low-pressure water on the fire. 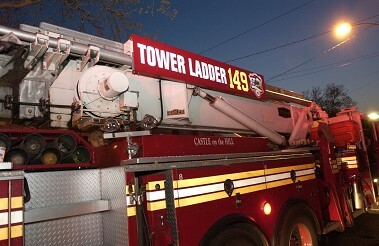 When it was brought under control, the members immediately were called to New Dorp on Staten Island for a small fire. Then back to Brooklyn before returning to Midland Beach, Staten Island, where there were numerous reports of people trapped. Firefighters saw cars floating by and people helping one another get out of their flooded homes. He said water from the street was coming through the doors of the apparatus and splashing around at their feet. They then were sent to Tottenville, Staten Island, where four homes were severely damaged by a tidal wave. The members of Ladder 149 were among those searching for members of a family who was swept away by the floodwaters. He said the search took an emotional toll on all the firefighters. And, while all this was happening, Firefighter Polovoy said that many of the members of his company were worried about their own homes in Breezy Point, Queens, an area that was flooded by the storm, and where 111 homes burned.